What's on your iPod now? "I've got a lot of songs, a little bit of everything. I like to listen to all sorts of music, everything from country to rap to heavy metal. I have some Tupac and Biggie and I also have been listening to Dwight Yoakam lately in the country department. I got some heavy metal on there with Disturbed and Godsmack. And, I also listen to Theory of a Deadman and Hinder. I'm all over the map." What are your favorite websites? "I check the hotmail all the time. I don't really have too many favorite websites, though. I check the Globe and Mail a lot. I like to read that. It's a good newspaper back home in Canada." Who would play you in a movie about your life? "I would say Johnny Depp." 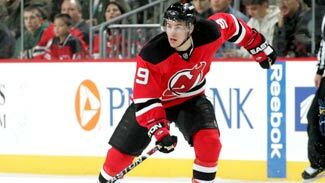 Who would you choose to play Devils All-Star forward Zach Parise in a movie? Chances are your choice would be far different than Parise's. Do you cook, order in or go out? "I normally order in. I have been on grubhub.com a lot these days. It has pretty much been my lifeline all year. I like the different restaurants you can order from. It's really good." Favorite TV show? "You know what, I don't really watch a lot of TV, but I have been watching a little bit of Prison Break, so that's probably my favorite one." Favorite movie? "I have to go with Braveheart. I have always loved that one. It's a good one. I also like any movie with Denzel Washington. He's good." What Hollywood starlette would you go out with? "Probably Megan Fox. She's pretty darn good looking." Favorite sports team of all time (excluding your team)? "I don't know if I should say this, but I always liked the Boston Bruins when I was a kid growing up. I liked Ray Bourque and Cam Neely." Favorite sports figure of all time (excluding yourself)? "I have to go with Gretzky just for the way he was when he played. I think he was an inspiration for a lot of kids, including myself." Tell me a little something about your hometown of Fort Frances, Ontario? "Well, I grew up in two places. I spent most of my childhood in a small town in Northwestern Ontario called Fort Frances. When I was 14 we moved to another small town in the Okanogan Valley in British Columbia called Penticton. My parents are there now. I was born in Winnipeg and moved to Fort Frances when I was one. Right now Penticton is my home. It's right in the Okanogan Valley, a great spot. It's a nice little, quiet town and it doubles in population in the summer with a lot of tourists. Temperature-wise it's one of the hottest places to be in Canada in the winter and the summer. It has a very good Junior A hockey tradition there and that's where I played. That was part of the decision why we moved to Penticton when I was 14. My dad saw that Brett Hull and Paul Kariya had played there."